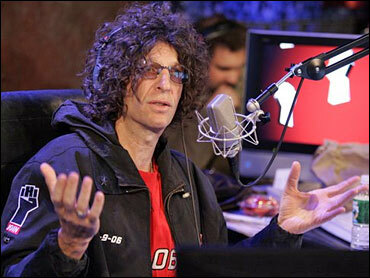 Radio shock jock Howard Stern has resumed his war of words with CBS on CBS. Stern - who is embroiled in a multimillion dollar breach of contract lawsuit filed against him by his ex-employer – was back on the Tiffany Network Monday for an appearance on the "Late Show with David Letterman." Stern left CBS in December to move to satellite radio. Letterman gave Stern a good-natured introduction. "It's weird not having Howard on the regular radio," said Letterman while Stern was still backstage. "It's like having a loved one who passed away: you can still sense his presence, but you can only contact him through satellite radio." But there were no hearts and flowers and reconciliation was definitely not on the menu, as Stern strode onstage wearing what he called the "official I hate Leslie Moonves' t-shirt," with a photo of Moonves – CBS president and CEO – at the Oscars. Stern – who signed with Sirius Satellite Radio to escape clashes over the often over-the-line content of his show – blasted Moonves for partying at the Oscars at a time when the network's radio division profits are down in the wake of Stern's exit. "I did nothing that they did not approve," said Stern. "Les Moonves has taken the stockholders' money and filed a frivolous lawsuit to try to cover up what's going on in the radio division." That's not how CBS saw it, dismissing suggestions that there was an effort to keep Stern off the Letterman show. "We did not stand in the way of Howard appearing on our own airwaves tonight," said CBS, in a statement. "We believe his appearance was his desperate attempt to distract attention from the facts of the case. We hope, in subsequent coverage of that appearance, the media is not seduced or fooled in any way. Howard Stern has done something wrong and we intend to demonstrate this wrongful conduct in court." Letterman tossed in a few kind words for the boss. Pointing to Moonves' record as the man who took the network from third to first place, Letterman said: "You can't not acknowledge the success that the guy has had." CBS' breach of contract lawsuit against Stern, his agent, Don Buchwald, and Sirius claims that in his final months at the network, he improperly used CBS radio airwaves to promote his new show on Sirius. CBS also says Stern discussed his plans with Sirius without disclosing them to CBS as he was contractually required to do. CBS wants Stern, his agent and Sirius to return any financial benefits they received from using CBS radio to promote Sirius, including the value of a block of Sirius shares Stern and Buchwald received early for exceeding a target for subscriber increases by the end of 2005. That block of stock was originally worth $100 million at the time the Stern deal was announced in 2004, but its value doubled by the time Stern actually received the shares at the beginning of 2006, bringing the total value of his five-year deal to about $600 million. Stern's not sure what his next move is going to be. "I have to figure out if I want to countersue," Stern told Letterman. "I came on to defend my honor... and I will fight back, as I've done my whole career." The "Late Show" host was briefly able to lure Stern into lighter fare, showing some "before" and "after" pictures as he asked whether there have been some surgical changes to one of radio's best known faces. Stern, 52, admitted he did have some plastic surgery, including having his nose "shaved down a bit." The plastic surgeon, says Stern, "snuck me in, in the morning, so nobody would see my humiliation." The surgery, says Stern, "made absolutely no difference in my face." He then turned his attention to Letterman. "You can look like this, too!" said Stern, asking his host if he, too, has had a turn at the plastic surgeon's. "You've never done anything?" said Stern, waiting for an answer. Letterman, who turns 59 next month, made it clear he's fine with the laugh lines he's earned and other alterations delivered by nature over the years. "Look at me!" said Letterman, showing off his face. "Honest to God!"